A San Diego woman who witnessed Thursday night's deadly attack in Southern France said the truck that plowed into a crowd of Bastille Day revelers left behind a "pathway of bodies." The truck drove through a crowd of pedestrians celebrating the national holiday in Nice, just blocks from a busy tourist site, NBC News reported. At least 84 people were killed, including many children, and dozens of others injured, according to authorities. 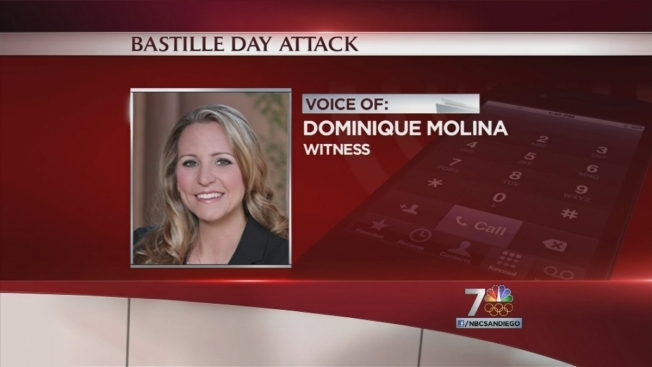 Dominique Molina, co-founder and president of San Diego-based American Institute of Certified Tax Coaches, witnessed the attack from her balcony while on vacation with her family. "It's horrific, it's really horrific. I've never seen anything like this in my life," Molina told NBC 7 San Diego on the phone just hours after the attack, which French President Francois Hollande said was an "obvious terrorist attack." According to reports, the truck drove into a crowd of pedestrians watching fireworks. NBC 7's Candice Nguyen has more. She was with her 14-year-old son and her husband when she witnessed the attack. A fireworks show had just wrapped up, Molina said, and thousands of people watching began to flood the sidewalks and streets to go home. "Within seconds of that, I started hearing the noises and looked to the west and there was a moving truck driving on the promenade running people over," she said. "Now I know, looking at some of the images, he had started about a mile away to the west and he was just mowing people down." Molina said she saw the truck drive "full speed" over the crowd. 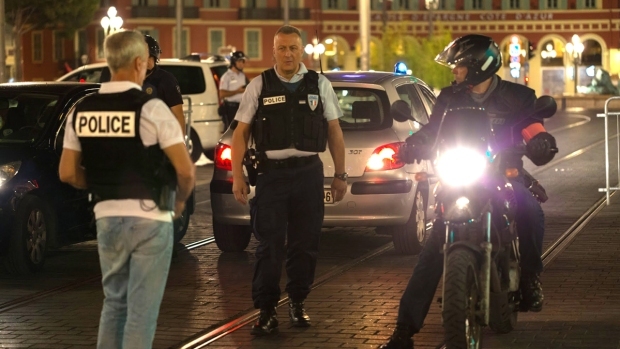 A ranking politician of the Alpes-Maritime department that includes Nice said the truck drove through the crowd for about 1.2 miles, the Associated Press reported. "I cant even tell you how many people I saw die in front of my eyes," Molina recounted. Molina says the truck moved east and, at one point, she couldn't see it anymore — that's when she heard gun shots. "As soon as he went out of our view, I started hearing gunfire. A lot of gunfire. It was like a shooting range," she said. The shooting lasted for a minute or so, she recalled, before there was total silence. "Horrific screams of agony" filled the air, she remembered, as people realized how many bodies there were lying on the ground. Molina recalled seeing people screaming and running from the beach towards where her apartment is located. Hours later, the street below her apartment was still an active crime scene. "You have to understand the crime scene itself is two miles long, there’s just a pathway of bodies," she said. The driver was killed by police, Hollande said in an address early Friday morning. It wasn't immediately clear if he had any accomplices on the attack, which Hollande called a "monstrosity," but authorities are looking into his identity. Europe, especially France, has been beset by bloody terror attacks in recent years. Paris was twice targeted by terrorist attacks — a rampage that started with an attack on the Charlie Hebdo magazine in January 2015, then an assasult that culminated in hostages taken at the Bataclan concert hall in November. In Nice, a city in the French Riviera near Monaco, other witnesses to Thursday's attack described seeing people mown down and the driver of the truck pull out a gun and fire at the crowd, NBC News reported. Molina told NBC 7 that she wanted to shield her 14-year old son from the violence. They are still shaking hours after the assault, she said, traumatized from witnessing the attack. "From my terrace, you can just see bodies, everywhere, and they're still there right now, I can still see them. It was just very, very horrific," she said. Molina said her family is struggling to process what happened Thursday night. "I feel relieved to be safe but at the same time in a weird way I feel a little guilty, that I was safe from it. I cant explain why, it’s a strange feeling," she said. She left San Diego the day after the Fourth of July, she said. The family is supposed to stay in Nice for the next week, she said, but she said their plans going forward aren't as clear as they once were. "Part of me would rather be home. But also I feel this weird connection here and I feel so horrible for the victims and their families," she said. "It would feel like running away from them ... I’m not real sure what to do."